Thousands of teachers and community members welcomed students back to school at DeKalb County School District (DCSD) by hosting live entertainment, offering free health screenings, and introducing community resources. DCSD held three Back-to-School rallies on Saturday, Aug. 4 at the Center for Pan-Asian Community Services (CPACS) in Chamblee, the Robert R. Freeman Administrative & Instructional Complex in Stone Mountain, and Exchange Park in Decatur. The rallies were held in conjunction with DCSD’s semi-annual Knock, Walk, & Talk event, which features district staff visiting respective neighborhoods and businesses for one-on-one conversations. Students at every grade level were welcomed by future, past, and present teachers and administrators at all three rally locations, which were picked strategically in DCSD’s north, central and southern areas to help the most students possible. Book bags, legal aid, health screenings, food, beverages, and other resources were offered to attending families. 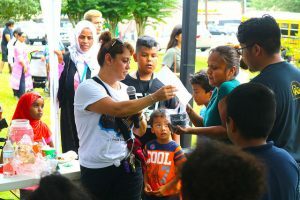 Each rally also hosted raffles for additional resources that included additional books, school supplies, grocery store gift cards, and more. 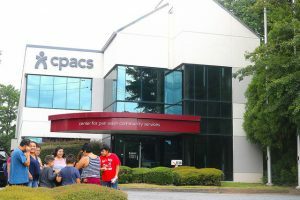 At CPACS, attendees were entertained by Chamblee Charter High School’s marching band and drumline. Attendees also took part in Zumba demonstrations as well as dances led by DCSD administrators, while tutors, the Junior League of DeKalb County, and county representatives advertised their services. Southwest DeKalb High School’s marching band entertained attendees at Exchange Park with several marching band takes on popular songs, as well as staples of the genre. Dancers joined the band as guests browsed through tables set up by community partners. Both Stephenson and Redan High School bands and dance troupes entertained guests at the Robert R. Freeman Administrative & Instructional Complex. The bands were joined by teachers Sheldon Strickland, a second grade teacher at Kingsley Elementary, and Rayshun Casey, a sixth grade teacher at Redan Middle, showcased their own talent of education-based hip-hop. Families began showing up to all three locations as early as 10 a.m. to receive DCSD resources. The rallies lasted until 4 p.m. at each location. For more information on Back-to-School 2018, visit www.dekalbschoolsga.org/back-to-school-2018/.